HONDA'S CB650F is by no means a bad-looking machine but it's a bit, well, how shall we say? Conservative by contemporary naked-bike standards. Amongst the new NC750s and CB500s on Honda's stand at the Eicma Milan show this week were these two uncharacteristically radical concepts. The first, named the CBSix50 (see what they've done?) 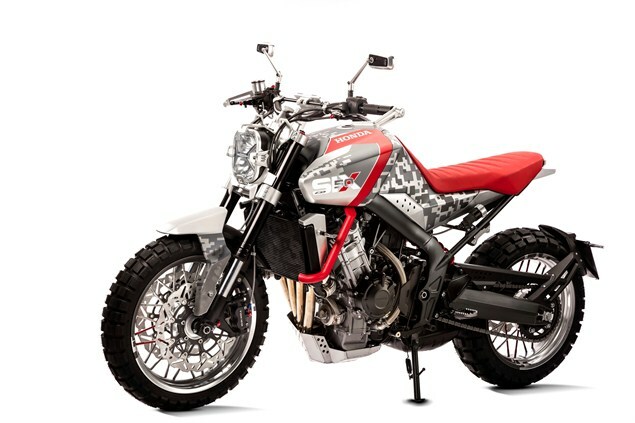 threatens to make BMW's new R nineT Scrambler look a bit 2014. It's got a ribbed red seat, knobbly tyres, wire-spoked wheels and an engine bash plate (for all that off-roading it's going to do?). The second, called the CB4, is a sort of retro-futurist take on the straight-barred naked bike and maybe what the CB650F should look like in the first place. Or at least it should be available as an edition of the model.